It’s funny how characterization and, indeed, scripting can take unexpected turns while you’re in the middle of the creative process. Originally this was going to be a dry dissertation from two of my ducks about what sort of thing you’d be seeing here over the course of the next… however long this may run. “But,” I thought to myself, “would they really get through such a thing uninterrupted?” Of course they wouldn’t. So, Rusty entered the frame. “So,” I asked myself, “why would Rusty care so little for what Poe and Shimako are up to?” Aha, he’s fleeing something… or someduck. Thus, Roger joins the scene. After that, the script sort of wrote itself. When I was done with Rusty’s rant I knew that I’d nailed a key bit of characterization and managed to accomplish my original goal with the strip all in one fowl fell swoop. I’m a genius, eh? 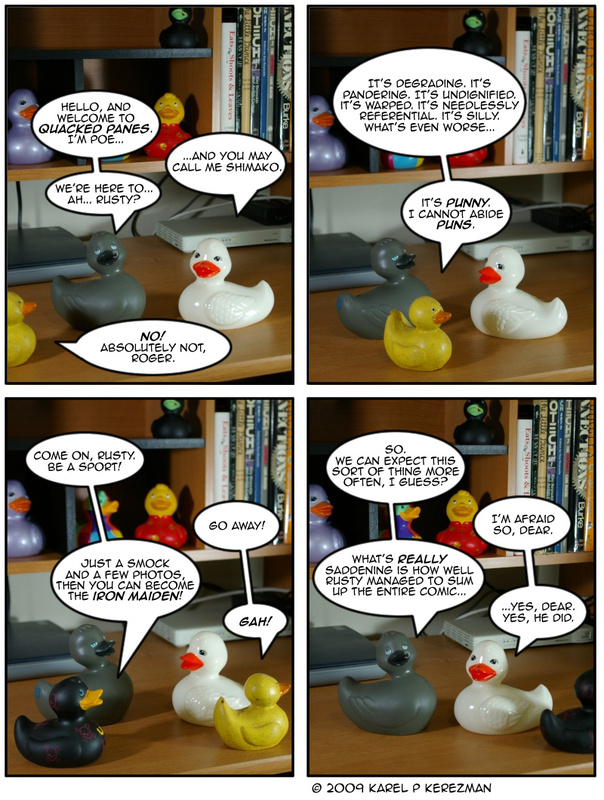 somewhere off-panel, the Ducklings are saying “Excellent! !” and jamming on air guitars. Great!! Can’t wait to see moar!